This is the first Mayan ruin I ever encountered. It came after a heat stroke inducing trek up a slippery hill wearing flip-flops. When I got there, I wasn’t particularly impressed. Fortunately, the next day, Tikal exceeded all expectations. I didn’t have much intention of sharing this photo, but as I’m really far behind on my daily posts and struggling with a laptop that likes to crash just as I finish processing a new photo I thought I’d quickly upload this one. 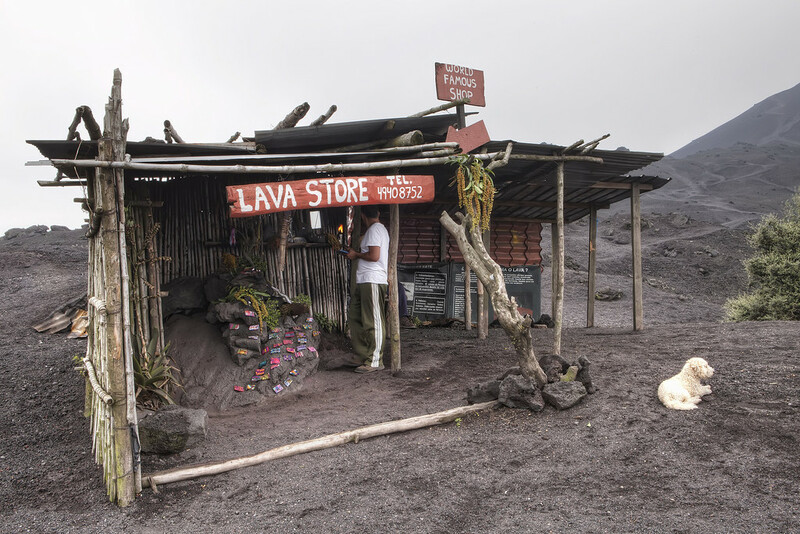 After a three hour slog up the side of a volcano, this is what you find when you’ve arrived. It’s one of the weirdest stores I’ve ever seen. I can’t figure out what it sells, other than the purses you can see there, and why does it need to advertise a phone number? What possible reason could you have for calling this shop? 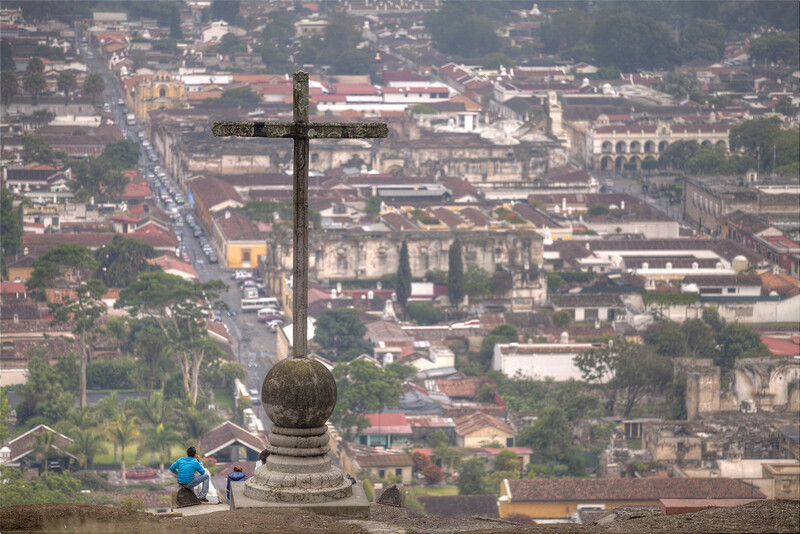 This cross is up on the hill overlooking Antigua. 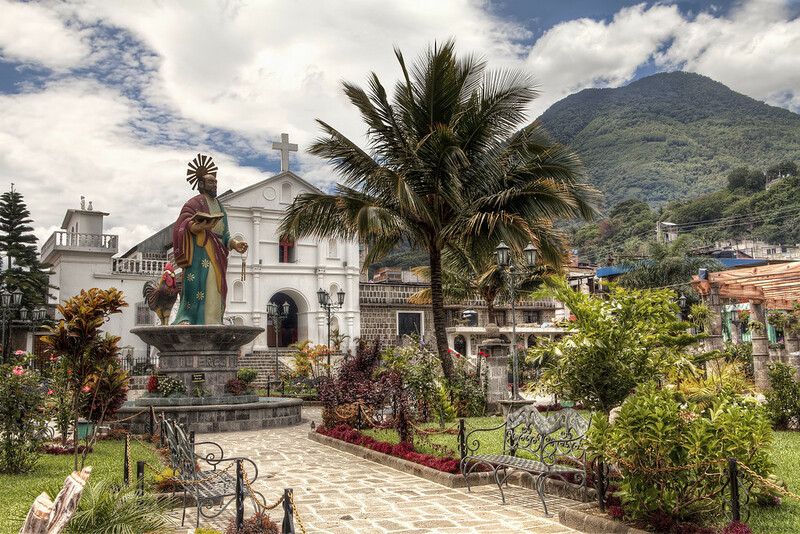 On a clear day this vantage point would give you a good view of the Antigua volcano looming large over the city. I wasn’t there on a clear day. Here’s another view of the church featured a couple of days ago. After taking a tuk tuk up the volcano we were on our way back to our boat when we passed a colorful garden. We asked our driver to stop and hopped out to explore. We climbed the stairs into the garden and realized this little white church and interesting statue was positioned at the far end. 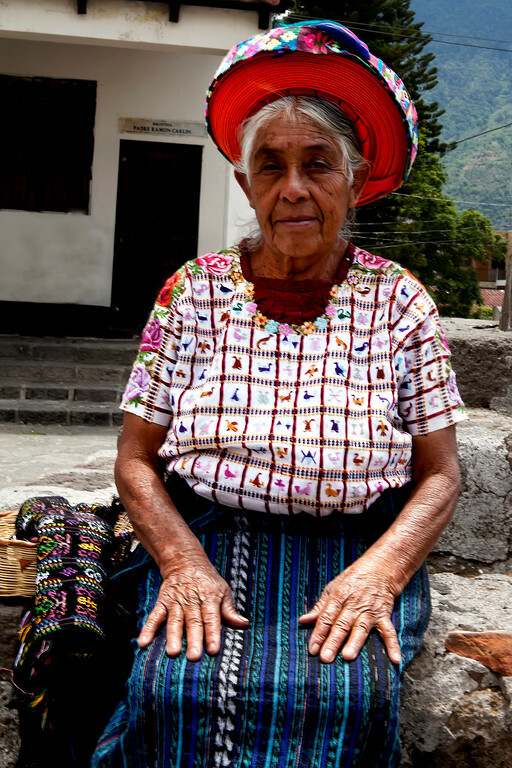 I had read about the Tz’utujil women of Lake Atitlan’s hats made of meters of ribbon wrapped around their heads. I couldn’t even begin to picture what it would like though. I was glad when I found this lady and now I know exactly how these hats look. 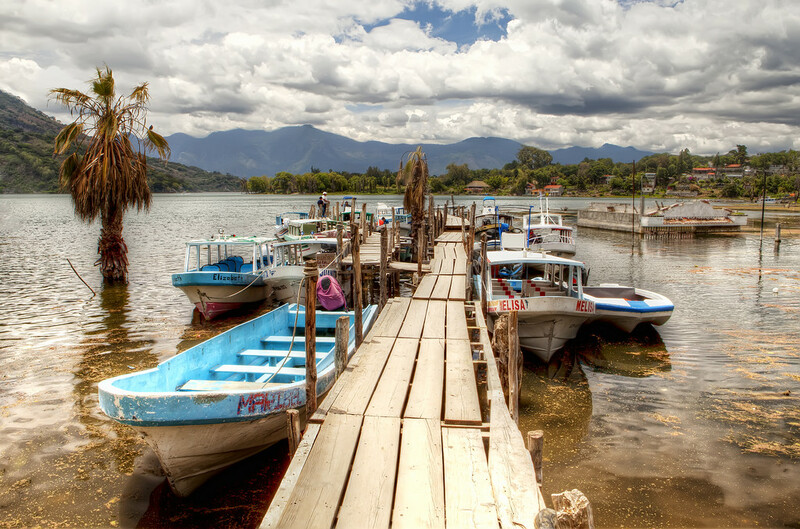 Here’s another dock on Lake Atitlan. This one was pretty flimsy, I had to find a moment when people weren’t walking on it to take this photo as my camera was bouncing up and down when people walked back and forth. 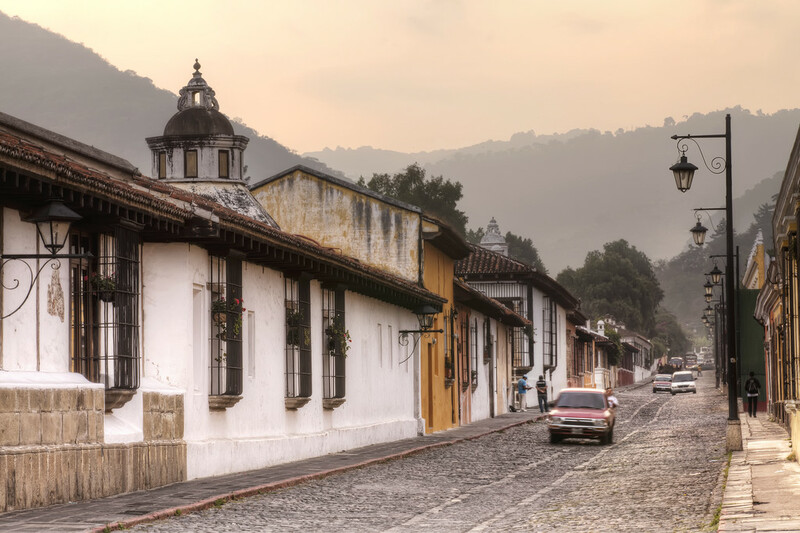 I really like this old colonial style street in Antigua, Guatemala. You can see how quickly this former capital of the country gives way to the forest that surrounds it. It’s quite a lively place with a lot of foreigners putting down roots there. 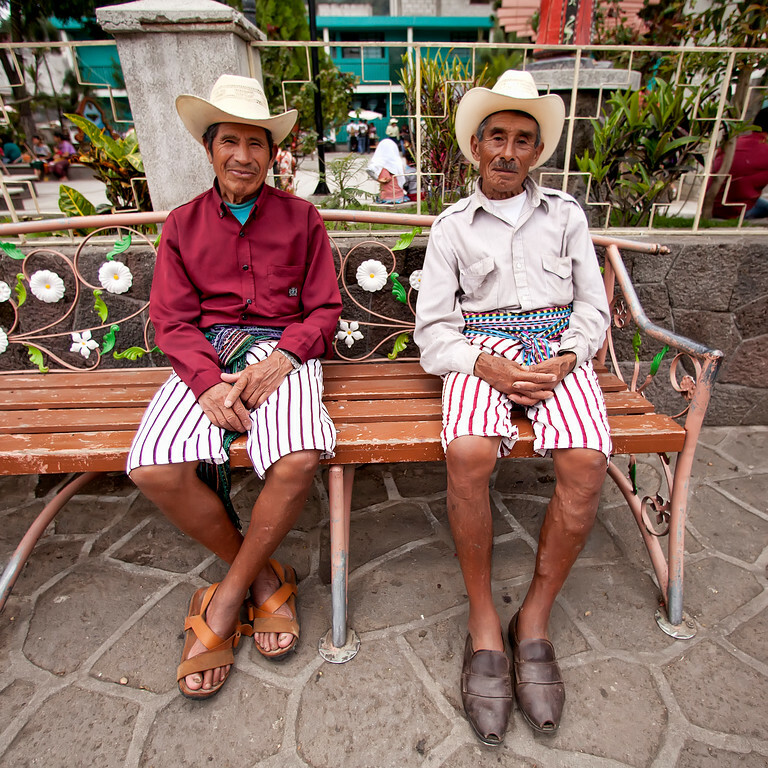 I was wandering through a town on Lake Atitlan when I came across the Tz’utujil men relaxing on a park bench. 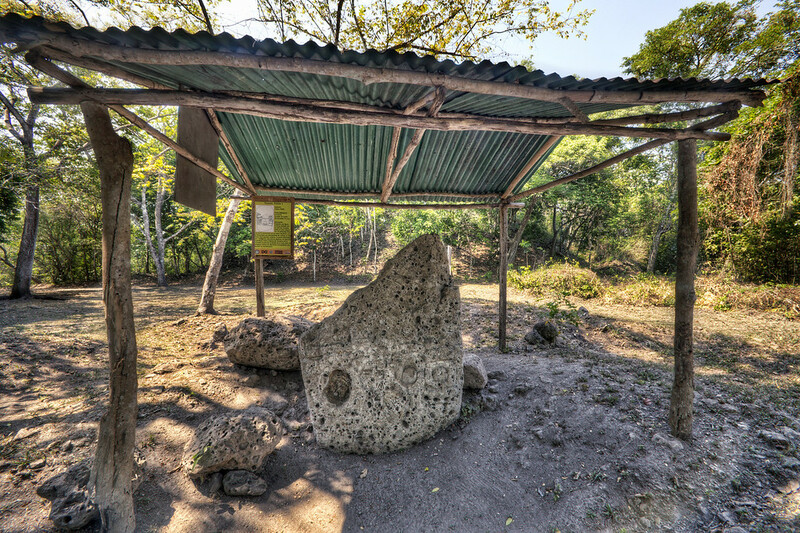 The Tz’utujil are one of the 21 Maya ethnic groups that inhabit Guatemala. 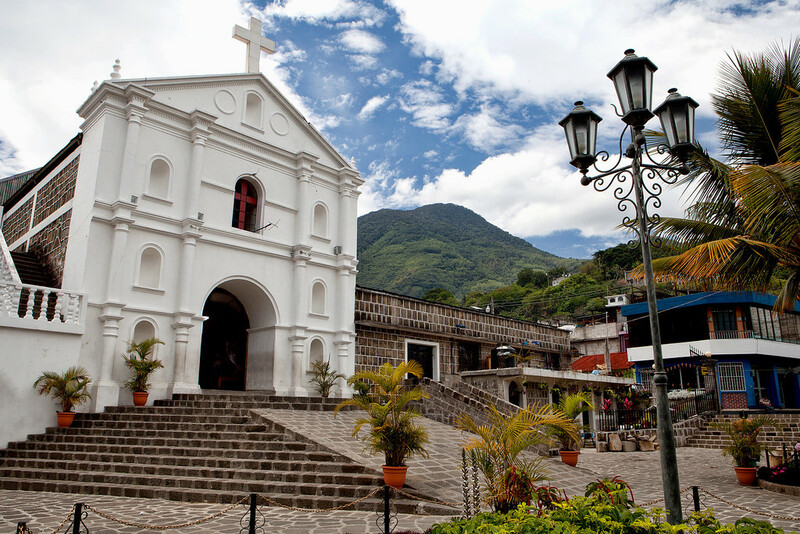 There about 100,000 Tz’utujil inhabiting the area around Lake Atitlan. 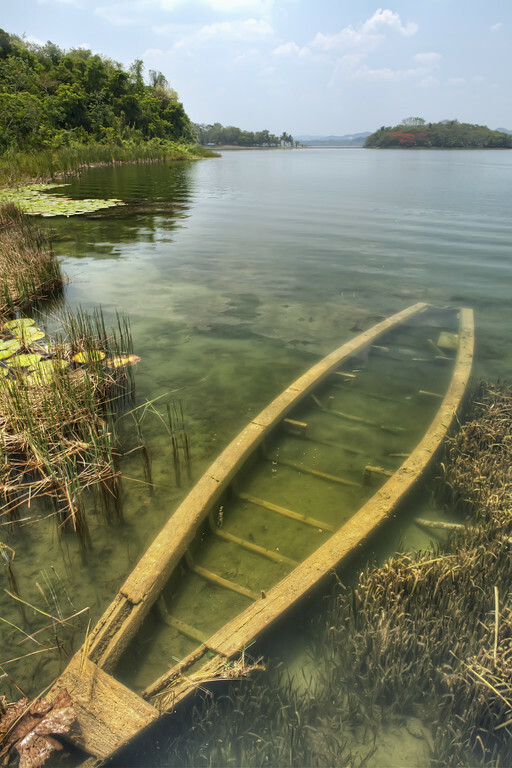 I’ve had this photo sitting around for a long time as I posted a similar one shortly after getting back from Guatemala.